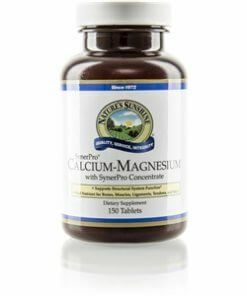 Nature’s Sunshine Calcium Magnesium SynerPro assists the body by strengthening the teeth, bones, skin, and tendons. 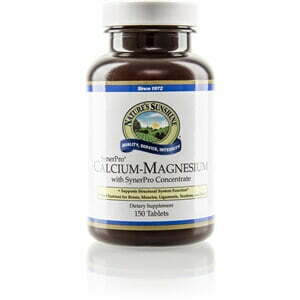 Calcium Magnesium SynerPro also encourages proper circulation and balances pH levels. Calcium and magnesium work best when used together. Calcium, known widely for its importance in bone health, also supports the muscular system, the nervous system, and the circulatory system. Magnesium stimulates enzyme activity in the body, and, when used in conjunction with calcium, also supports muscular and nervous system health. Heavily processed modern diets remove magnesium from most magnesium-rich foods, making supplementation necessary. Calcium Magnesium SynerPro blends these two key nutrients with vitamin D, zinc, copper, boron, and phosphorus, all from natural sources. The formula includes Nature’s Sunshine SynerPro base. Cellulose (plant fiber), stearic acid, and sodium lauryl sulfate.